Prime Minister Benjamin Netanyahu of Israel presenting the Iranian documents in Tel Aviv in April. 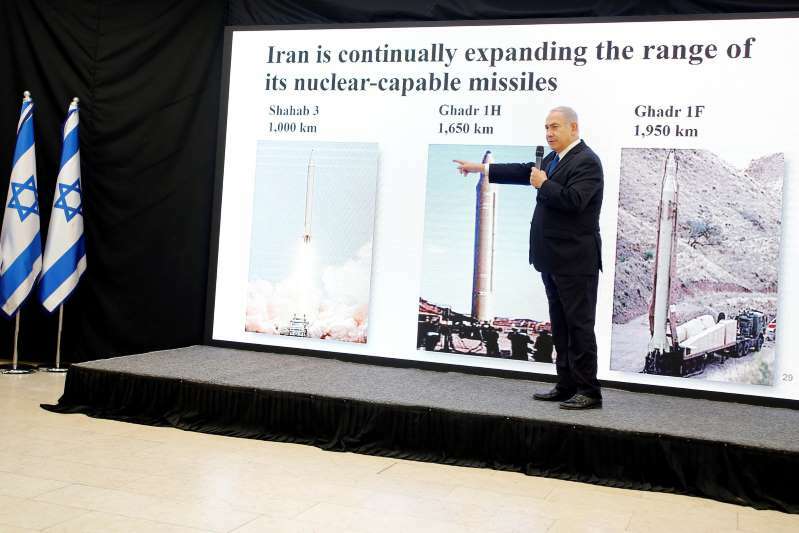 Iran has denied as “laughably absurd” a detailed Israeli claim that intelligence agents stole clandestine Iranian documents this past winter that reveal what Israel has called Iran’s extensive past research on nuclear bombs. [post_ads]The Iranian denial, issued by the country’s United Nations mission, was in response to articles in The New York Times and other publications in recent days about the detailed claim by Israel, which considers Iran its most dangerous foreign threat. The Times article, published in Monday’s print editions, and similar accounts in The Wall Street Journal and The Washington Post, were based on a partial viewing of the documents by journalists from those publications at the invitation of the Israeli government. Israeli officials also provided new details on how they said the documents had been obtained — through a secret raid on a Tehran warehouse on Jan. 31 by agents of the Mossad, Israel’s intelligence agency, equipped with blowtorches. The trove included what the Israelis described as 50,000 pages and 163 compact discs of memos, videos and plans for building weapons. There was nothing in Israel’s claim that suggested the Iranians were still engaged in such activity, which American intelligence reports have said ended in 2003. But the documents suggested not only that Iran had been deceitful but also that its work in weaponizing nuclear power had been far more sophisticated and organized than initially suspected. The authenticity of the documents, which purport to be at least 15 years old, has not been independently confirmed. Iran has always denied accusations by Israel and others that Iranian nuclear work was meant for military purposes, a denial that Iran’s United Nations mission reiterated in response to Israel’s latest claim. Prime Minister Benjamin Netanyahu of Israel first announced the results of the seizure in April after he had given President Trump a private briefing. Just days later, Mr. Trump made good on his longstanding vow to renounce the 2015 nuclear agreement with Iran that was negotiated by the Obama administration and the governments of five other major powers, including major European allies of the United States.